Place eggs, sugar, oil, milk, vinegar and vanilla in the bowl of a stand mixer. Blend until smooth. Add in flour, baking soda, salt and cinnamon. Mix on low until fully combined. Stir in grated carrot and pineapple by hand. Pour batter into your temp-tations® 11" x 7" baker. Bake for 30 minutes or until a toothpick inserted into the center comes out clean. Cool completely before frosting. Frost the top of the cake with cream cheese icing. 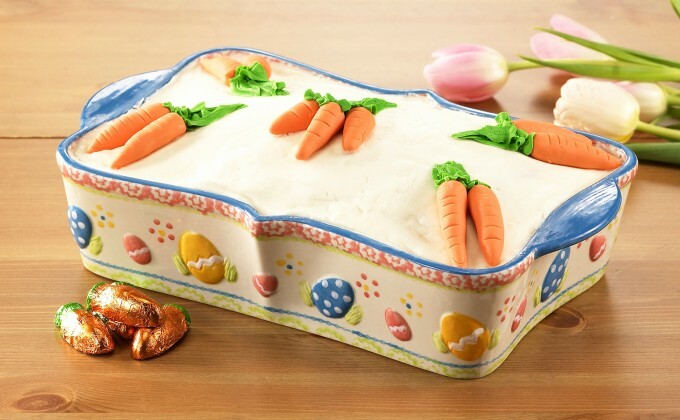 Shape orange fondant into little carrots and arrange on top of cake in bunches of two or three. Add stems using green icing.